Critical for canine kidney disease and feline kidney disease!!! Great Taste too! This enzyme product is safe yet powerful and works in two ways to help chronic renal failure: 1) on an empty stomach at night---helps break down toxins from proteins in the blood, reducing symptoms of uremia (nausea your pet experiences in the morning) 2) taken with food---it breaks down the protein, improving digestion and reducing the load on the kidneys. This pet health product is a must for feline kidney disease or canine kidney disease!!! It is also important for other conditions such as liver disorders as well. Best of all this product is easy to administer. Simply open the capsules and sprinkle on food. We have had excellent taste approval from even the pickiest cats who seem to really like the taste. Kidney Health Protein Support For Pets is a powerful, yet very safe, enzyme formula that provides vital systemic benefits including support for modulation of the immune system, breakdown of proteins in food, reduction of heavy metals in the body, control of allergy symptoms and support for impaired kidney function. Please note that this brand is SPECIAL---just like with Power Probiotic, these are exceptionally high quality enzymes that really work. The product is expensive but it is because Kidney Health Protein Support For Pets is manufactured as a pure, effective product without lots of additives and other herbs---it is worth the price!! This product is extremely beneficial for pets with kidney impairment because it helps to break down the proteins and reduce the amount of toxins in the blood. This can help your uremic pet feel much more comfortable. Glomerulonephritis results in a build up of protein in the membranes of the glomeruli of the kidneys. Fluids must pass through this membrane in the intial phase of the filtration of the blood by the kidneys. Research on protease and proteolytic enzymes in general is promising and can be extremely helpful in cases of kidney disease. The product can be taken with or without food depending upon the objectives you are trying to achieve. This is a high quality, premium product that can achieve health benefits in a variety of ways! There is no substitute---you will not find the same quality and purity in the stores! TPPTM Protease is a proprietary blend of highly active proteolytic enzymes with a wide range of pH stability. Proteolytic enzymes taken orally under certain conditions have been shown to be absorbed in substantial quantities into the blood. Once in the blood circulation, the enzymes in this blend bind to serum proteins, particularly alpha 2-macroglobulin (a2M), and impart immunomodulatory benefits. One of the best-established functions served by the oral proteases in TPPTM blend is in the maintenance of normal blood flow. This is accomplished by breaking down blood clots (fibrinolysis) and platelet aggregation within blood vessels and breaking down excess extra-vascular plasma proteins as in edema. TPPTM Protease will also enhance the hydrolysis of food proteins for enhanced bio-availability of amino acids. -IMPAIRED KIDNEY FUNCTION - Glomerulonephritis: In this disease there is a build up of protein in the basement membrane of the glomeruli of the kidneys. Fluids must pass through this basement membrane in the initial phase of the filtration of the blood by the kidneys. Recent research using an animal model of this disease "lends further support to the concept that enzymes capable of degrading immune complexes in situ can ameliorate glomerulonephritis". -HEAVY METAL TOXINS - Heavy metals such as lead (Pb) and mercury (Hg) exert their poisoning effect by binding to ionizable or sulfhydryl groups of proteins, including vital enzymes. Once these metals bind to an essential functional protein, such as an enzyme, they denature and/or inhibit it. This interaction of heavy metals to proteins can lead to degenerating diseases, nerve damage or even death. When taken on an empty stomach, it should be noted that protease is readily taken up into the mucosa cells of the intestine and passed into blood circulation. Clinical observations have noted that upon high intake of TPPTM Protease, heavy metal concentrations have been significantly decreased in the blood. -MODULATION OF THE IMMUNE SYSTEM - As a result of their coupling to a2M, Tzymeô proteolytic enzymes exhibit an increased binding of several very important cytokines (hormones-like molecules which have a powerful influence on immune cells) such as Transforming growth factor-beta (TGF-b), and Tumor Necrosis Factor-alpha (TNF-a). Studies have indicated that oral hydrolytic enzymes affect cytokine synthesis and modulatory effects. For instance, TNF-a synthesis, which is a necessary step in host defense against tumor cells, is impaired when experimentally inactivated oral proteolytic enzymes were used. Thus, active, GI stable and functional oral enzymes that are absorbed in the blood stream can provide therapeutic applications. In addition, studies have shown that oral proteolytic enzymes increased the tumoricidal and cytotoxic activities of polymorphonuclear neutrophils. TzymeTM Protease Blend in TPPTM Protease provides vital systemic benefits that include support of adequate blood rheology for optimum flow of immune cells, their meditating molecules, hormones, blood cells and other vital molecules and cells. The superb absorption abilities and high functionality of this product are certain to enhance and optimize overall protein hydrolysis. These benefits, in turn, facilitate and support a wide array of metabolic processes. Bromelain, an important addition to the TzymeTM Protease Blend, is a protease derived from the pineapple plant. It has been used for many years as a digestive aid, anti-inflammatory and burn debridement agent. Its actions help to prevent swelling/edema, promote smooth muscle relaxation, inhibit platelet aggregation, and enhance antibiotic absorption. Bromelain is also used in cancer treatment, ulcer prevention, sinusitis relief, appetite inhibition and shortening of labor. Proteolytic enzymes administered orally improved the survival time, the hematological parameters of spontaneous lymphoblastic leukemia in rats, and the metastasis and survival time of mice with Lewis lung carcinoma. 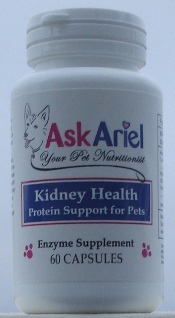 http://www.askariel.com to learn more about Kidney Health Protein Support For Pets.